Step 1: Start out with 2 coats of Pink Gellac Soft White. 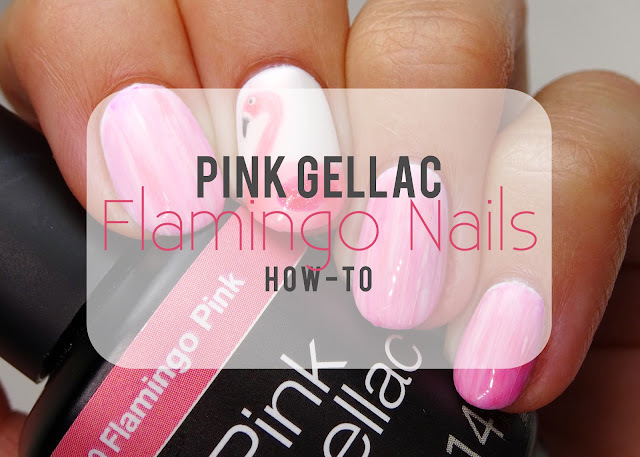 Paint your tip using Pink Gellac Flamingo Pink and the gel polish brush. Let it cure for 60 seconds in your LED lamp (UV: 120 seconds). Repeat until opaque. Step 2: Draw a '2' to create the flamingo's head and neck. Let it cure for 60 seconds in your LED lamp (UV: 120 seconds). 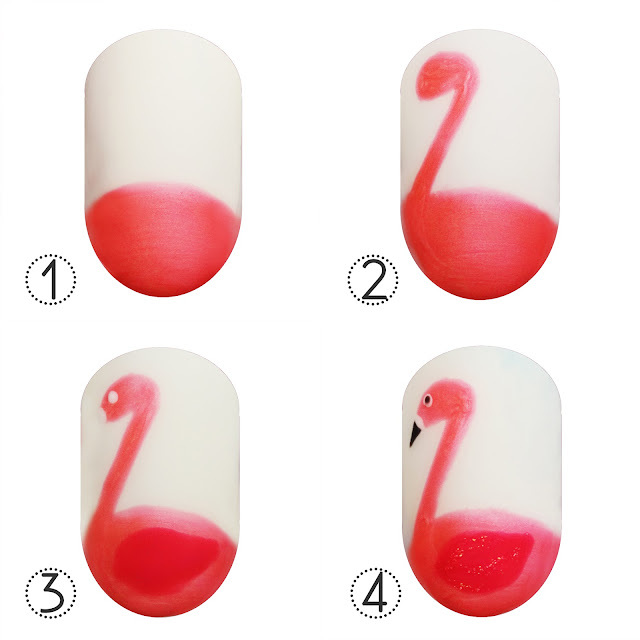 Step 3: Add some depth with Pink Gellac Dynamic Pink and paint using Pink Gellac Soft White and a toothpick 2 white dots, one for the eye and one for the beak. Let it cure for 60 seconds in your LED lamp (UV: 120 seconds). 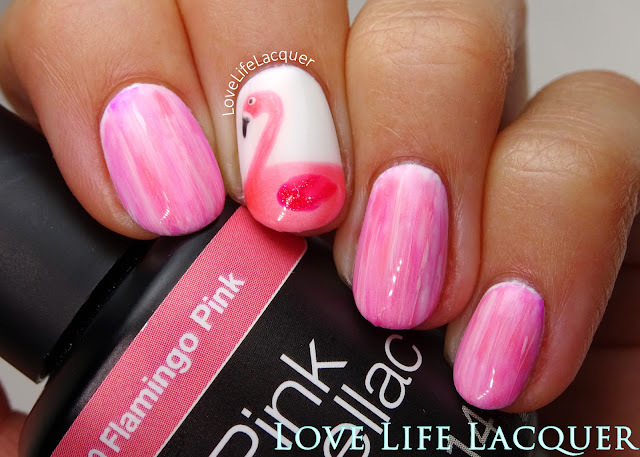 Step 4: Paint the eye and beak using Pink Gellac Beautiful Black. 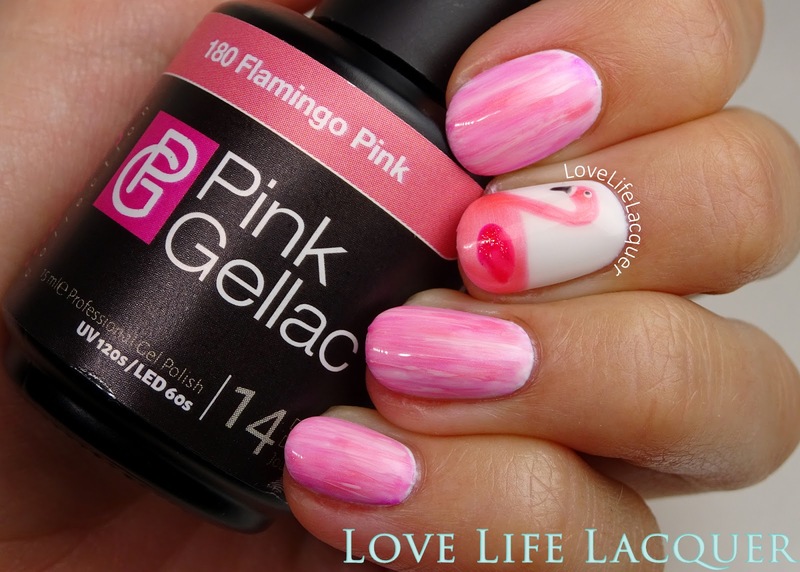 Add some more depth by painting on a bit of Pink Gellac Partylicious Pink. Let it cure for 60 seconds in your LED lamp (UV: 120 seconds). Step 5: Finish off with a top coat. The other nails are just a few different shades roughly brushed on the nail using a dry brush kind of technique.